​Do you have 60 seconds? Watch our new video that shows all the ways Alaska children get out and play for 60 minutes every day. You’ll see kids in Utqiaġvik chasing each other in the snow and kids in Bethel jumping down sand dunes. You’ll see kids in Unalakleet running through the neighborhoods, kids in Petersburg swimming, and kids in Sitka splashing in puddles and playing kickball. You’ll see children shooting hoops, climbing jungle gyms, jumping rope, tumbling, flipping, riding bikes, dancing and running among the totem poles in Southeast Alaska. They’re smiling, laughing and happy because they are moving. 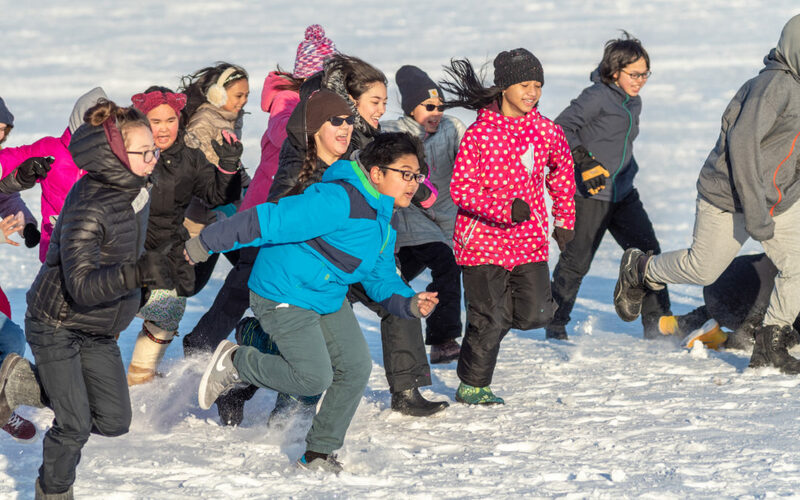 • A link to our longtime partner, the nonprofit Healthy Futures program that provides a free physical activity challenge through more than 150 Alaska elementary schools each year. You also can request a package of our educational handouts (rack cards) to share with parents regarding the health and academic benefits of daily physical activity. Play Every Day also has several educational rack cards about choosing healthy drinks instead of sugary drinks. Go online to find version 1, version 2 and version 3 of these rack cards. We talk to Alaska families before we make our materials. We have heard the challenges they say they face when trying to meet the national recommendation for 60 minutes of daily physical activity. They talk about a lack of time and a commitment to other priorities, like homework for children, chores and work for parents. They talk about challenging weather, which can mean cold, snowy, dark days in some communities and wet, rainy days in others. They talk about how cost can get in the way, with some sports and activities coming with price tags that are out of reach. They talk about a lack of opportunities in some communities, which don’t have pools or gyms open after school and on weekends. Play Every Day’s messages show there are ways to overcome those challenges to get to the benefits on the other side. Daily activity can mean time spent together as a family, going for hikes, riding bikes and playing basketball. Daily activity can help children grow up at a healthy weight and feel good about themselves. It can reduce the risk of developing diseases that can last a lifetime, including type 2 diabetes and heart disease. Physical activity also can improve academic performance, including grades and focus in the classroom. Over the years, we have found so many examples of Alaska children facing cold, snowy or rainy days and choosing to play anyway. Utqiaġvik kids dressed in their parkas and snow pants and turned a snow pile into a fun place to slide and jump. Bethel kids did the same thing with a sand dune. Puddles on the Petersburg and Sitka playgrounds became opportunities to splash. The kids threw on their raincoats and played outside, even finding a break from the rain under the covered playgrounds that some Alaska schools build to help children stay active in wet weather. After playing in the snow, Utqiaġvik kids could warm up inside by playing at recess in an entire jungle gym and basketball court that’s built in the heated school building. Learn more online about ways to support daily physical activity for the children in your life.